What a week! So much planning, so much sweat..all for a 2 hour party. It was worth it though because everyone had a great time AND I managed to be as environmentally friendly as I could. I started to get hella frustrated about it (okay lets face it I had several melt downs and my friends had to talk me down) because I just could not find good vendors for what I was looking for. Like an organic baker. I never did find one...although I did find one that made organic cupcakes. Well to her they were organic (they only thing organic about them was that they had organic green tea in them) but to me they were not and I certainly was not going to pay extra because they were "organic". Seeds....seeds were the bane of my existence. Apparently I was a few weeks to late in looking for them as the seed companies come and take their product back so none was available in store. So that meant I couldn't make my seed paper invites. But in the end it all came together. So what did I do to make B's party more environmentally friendly yet still fun for a 1 year old? Since I couldn't find seeds I saw no point in making the paper for the invites (hello have you seen how long it takes to do that. I am just too busy lazy for that when it can't even be planted to make something grow). At the end of Seed Hunt 2010 I was less than 3 weeks out from the party so I had no time to figure out something new (and the hampster in my head was tired). So I sent an evite. OH NOS. Not for everyone I know but it worked for our families and it had no environmental impact! Balloons, streamers, confetti, plastic banners....all are not great for the environment. So I nixed them. I did however make a photo banner. I took 1 picture from each month over the year and glued them onto cardstock that was leftover from our wedding. I strung them together with some leftover raffia and pinned it onto a wall. With the photos I could have had them printed on Snapfish for free (with photo credits) but there is shipping involved with that and therefore emissions generated. So instead I had them printed at a local photo shop. I tried to do as much organic and local food as possible. Some things are just not a reality. Like organic chips. Who pays that much for a small bag of chips??? They were like $6. Insane in the membrane. I had hamburgers made by a local farm (Walsh Family Farm in Mount Pleasant). The meat was hormone and antibiotic free and hands down the best burger I have ever had. The corn, lettuce and onion were local from Ontario. The tomatoes and peppers were from my organic garden. Since I couldn't find an organic baker I decided to just make the cupcakes myself. I found 2 recipes online and made them both organic. In the Strawberry Lemonde cupcakes the vanilla cake mix, eggs, strawberries and lemonade were all organic. In the Smores cupcakes the chocolate cake mix and eggs were organic. The chocolate was fair trade. I served organic lemonade, organic homemade peach iced tea and pop (nothing environmentally friendly about that one though). I used our regular plates and glasses instead of disposable. Although for the kids I did have disposable available and I composted those. For cutlery I used plastic that I already had. I do not have enough non disposable for 30 people. I also used disposal napkins that I already had on hand. I put those in the composter too. I searched high and low for a company that sold seedlings that was not 3 hours away from us. Finally a week ago I found that company. I love how they turned out and the kids enjoyed getting them! There was minimal waste from gifts because people used bags that I can reuse. My sister even made a gift bag! B is going to love using it in the future...and hello it has dinosaurs on it! Anything that could be composted or recycled was. I love that our guests were asking what went into which bin. I had planned on having bins out and labeled so it was clear what went where but we had a minor fruit fly situation so I didn't want to make it any worse. 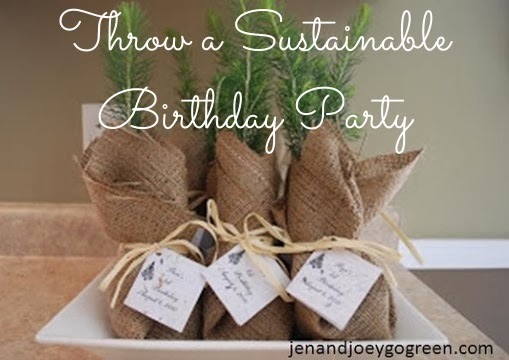 How have you made your parties sustainable?